Comedy Storytelling by an Australian,… Crikey! What’s up Lyon ? is the new English speaking humour event in Lyon at Complexe du Rire Theatre ! If you’re a Paul Taylor and co fan, come and laugh in original version. First show starring Marie Connelly on October 31. Long Way From Home is a one-hour show, talking about life in France as an Australian. It’s stories of those funny, sometimes ‘let’s take a deep-breath, shall we?’, expatriate moments in France. Life as the expat means thoughts like, ‘Why do they call me Mary all the time? My name’s Marie’ or ‘Is masculine or is it feminine, there are no hints, how to know?’ take up a ridiculous amount of one’s thinking space. But in the end it’s all okay because those ‘funny little expat moments’ come along with the foie gras, champagne and beautiful lake moments. There is balance after all. 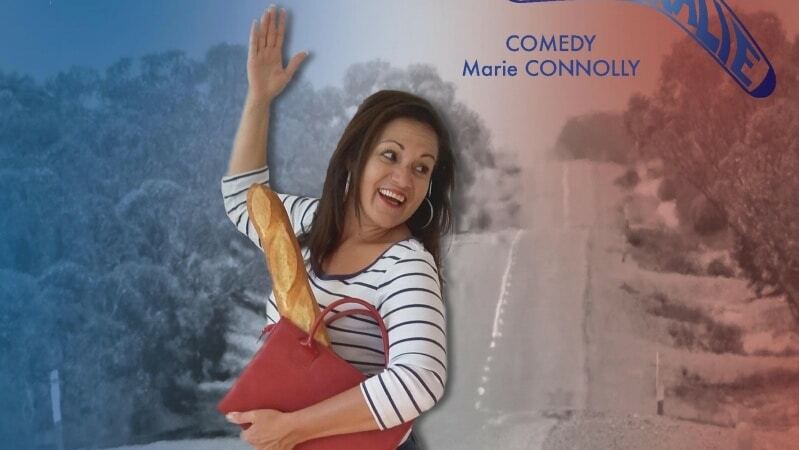 Come see the show, and let this Australian (who is a bit English at heart), take you through her journey of living and working in France, from Paris, to Nice, to the alps, to Lyon. Marie Connolly grew up in Brisbane, ‘Stralia. She skipped over the waters to the United Kingdom as soon as she was old enough, to go and live with all the other Australians holed up in South London. One grey rainy night in a back street pub in Picadilly Circus, she picked up the microphone and stepped onto the smallest stage ever, to make drunk people laugh, and has continued her comedy journey since (let’s call it a journey). She hosted a weekly open mic gig in London Borough before moving to France four years ago and now she is gigging in English and starting to gig in French too (cause life isn’t challenging enough). Long Way From Home is a friendly show, of one hour, and the audience get an added bonus of another comic, Karim Duval, performing fifteen minutes at the start of the show. More information can be found on theatre’s site. The theatre offer a formula of Tapas plus the show for those wanting to eat and have a drink beforehand, or simply the show, which starts at 8.30pm. Finally, for further information on Marie Connolly, visit her Facebook Page.